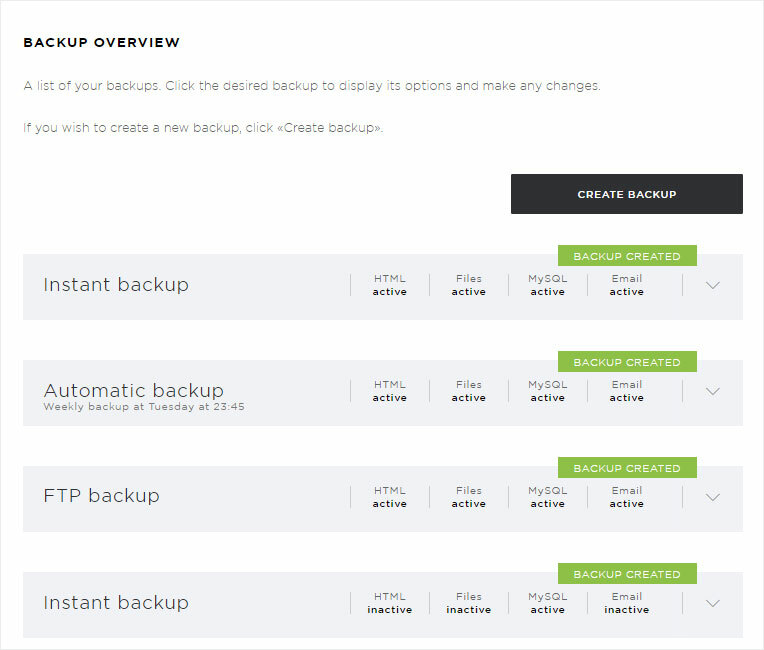 If you want to create a backup of the data in your hosting account, you have three options. «Instant backup», «Automatic backup» and «FTP backup» (save externally). 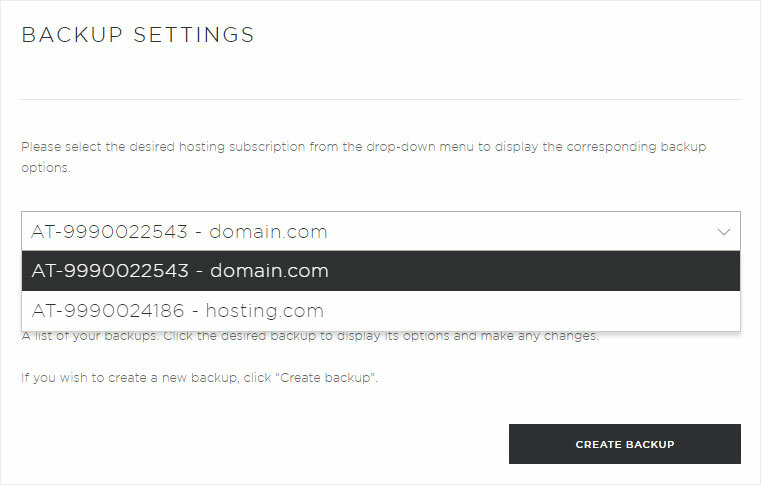 Select the hosting subscription containing data you want to back up. 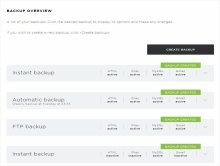 Click «Create backup» under «Backup overview». These are the website files stored in the «/html» directory. These are the MySQL databases that you have set up for your hosting account. These are the private files stored in the «/files» directory on the FTP server. All emails stored in your hosting account. Then click «Create» to start the backup immediately. 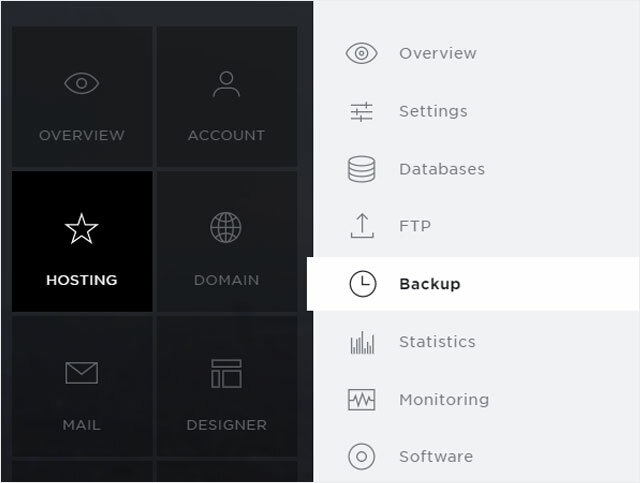 Your backup starts immediately. Tick the box «Configure as an automatic backup» if you want to perform the backup on a regular basis. 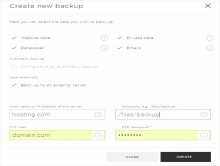 Now fill in the various fields as required for your backup. You can choose between «Daily backup», «Weekly backup» and «Monthly backup». Depending your choice («Weekly» or «Monthly»), you can select between the weekdays or days. Enter the hour (00–23) when you want to perform the backup. 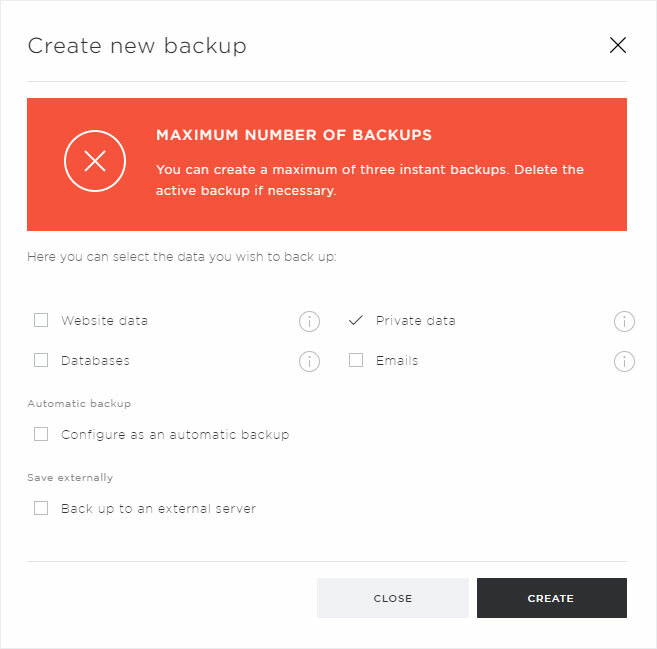 If desired, enter the minute (01–59) at which you want to perform the backup. Here you can set how many backups to keep (max. 3). Then click «Create». 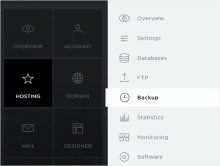 Your backup job is saved and executed automatically at the desired times. Note that you cannot activate the «Automatic backup» and «Save externally» options at the same time. Tick the box «Save externally» if you want to save the backup to an external server. Then complete the various fields as required for the target server. 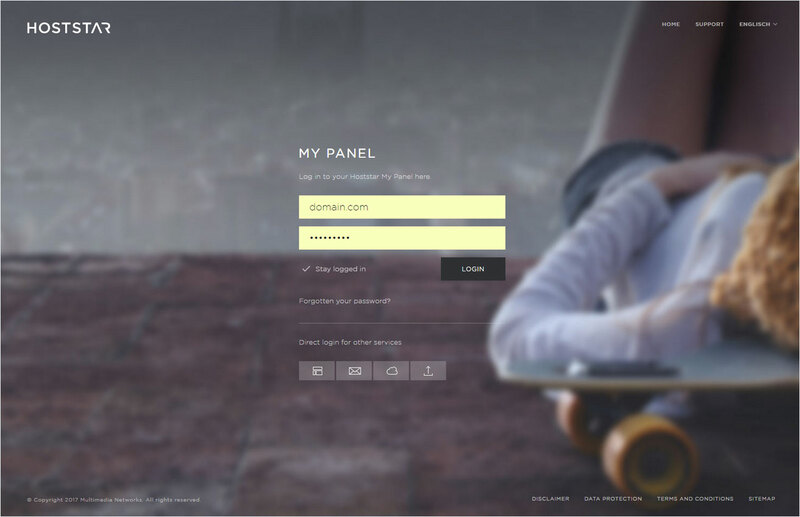 Enter the hostname (e.g. hosting.com) or IP address (e.g. 111.111.11.11) of the external server to which you want to save your backup. Enter the directory path (e.g. 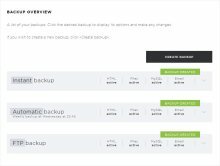 /files/backup) of the directory into which you want to save your backup. Enter the authorized FTP username (for the server) in this field. Enter the appropriate password here. Then click «Create». Your backup over FTP starts immediately. Note that you cannot activate the «Save externally» and «Automatic backup» options at the same time. 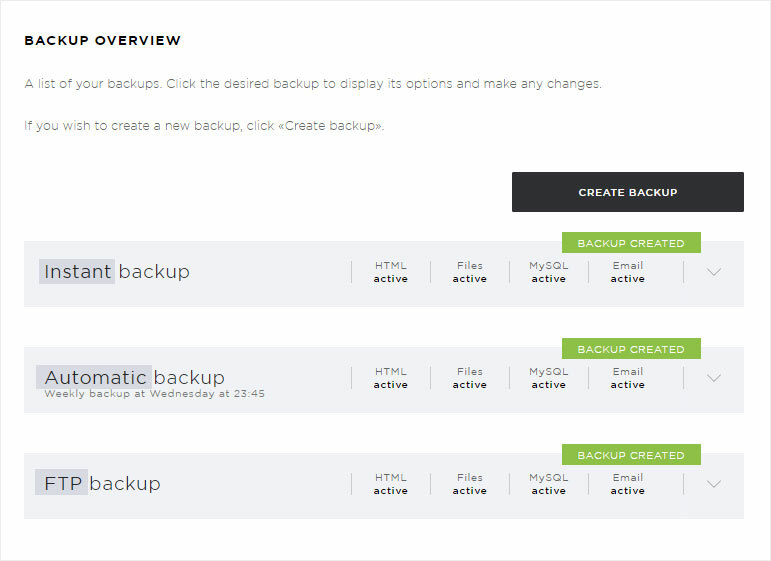 The backups appear in the «Backup overview». ...an error message appears when you attempt to create an additional backup. You should therefore remove one of your backups to make space for a new one.